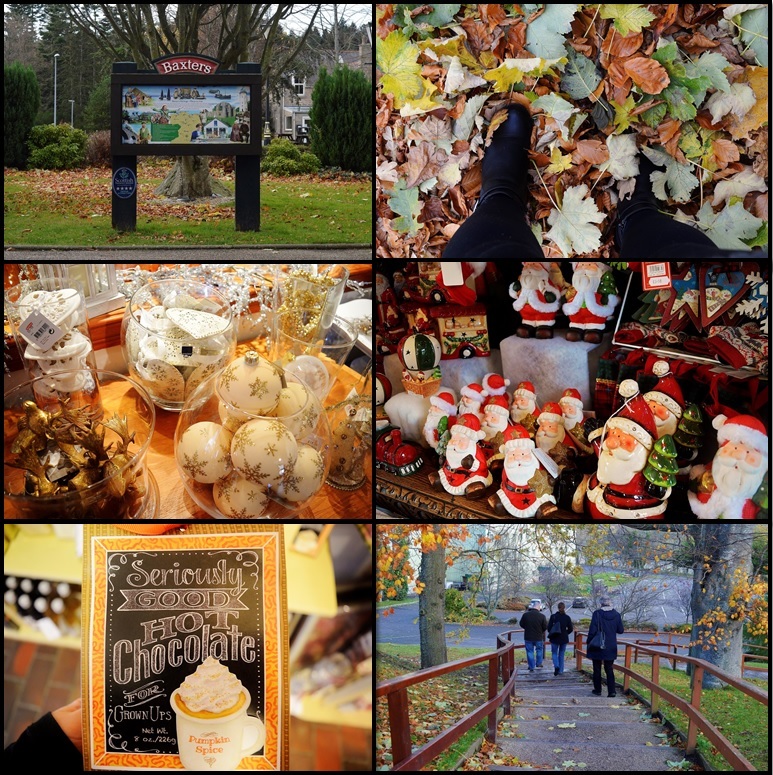 So on this particular day when I tagged along we braved the journey Northward (it was snowing) for about an hour to Fochabers to visit the Baxters factory and their food village; note, if I hear the words, 'food' and 'village' in the same sentence I'm there! Having only recently visited the BBC Good Food Show I was still very much in the foodie mindset and on the hunt for some more culinary delights. The Baxters Highland Village is home to a variety of specialist shops and sort of reminded me of a mini German market with an obvious Scottish Twist. From stores selling scarves, handbags and Highland fashion designer pieces to cook shops with a plethora of crockery, a cafe and let's not forget what we all came for, food stores and stocks a plenty, I was in my element. We took a visit to their newly opened seasonal Christmas store, which in all truth looked like Santa Clause had thrown up all over the shop, from baubles, trees, decorations, wreaths, plaques and ornaments to scented sticks you can literally hang on your tree this place had it all! Short of a real life reindeer this would be a perfect Santas grotto / workshop away from the North Pole. Thankfully I was able to compose myself enough to not run out of the store with all of the glittery goodness and take a few snaps in the process. Visiting the food village was enough to make the journey worth while, with chutneys, jams, spreads and samples a plenty I could have easily spent a small fortune on things I would just eat from the jar, and lets not get me started on their range of teas, coffees and hot chocolates! The Baxters food store stocks brands from independent retailers up and down the country which I love as it gives you a chance to try something a little different and can be considered a must visit and a haven for fellow foodies. Everything seemed to be quite pricey for the products they were selling, retailing a pumpkin spiced hot chocolate at £5.99 and I simply couldn't justify it with a cupboard full of hot chocs and coffee flavourings at home, so off we popped to the confectionery section - something we can ALWAYS justify. As luck would have it Baxters happened to stock my all time, new favourite chocolate brand, Seed and Bean who I discovered at the BBC Good Food Show in November - and given it is a little more difficult to come by in Aberdeen I plan to savour my Cornish Sea Salt and Lime bar throughout the festive season... maybe. We didn't stick around for lunch, none of us were very hungry on account of a lush McMuffin breakfast (oops) and Fochabers was just so cold and wintery we weren't sticking around in search for an eatery in town, so we headed on back to Inverurie for dinner, cake and a much needed hot chocolate. Overall I enjoyed my wee family day out (thank you Dad for braving the icy roads for our enjoyment!) I really think this would be a great family day out nearer Christmas, if the weather permits of course, it all just feels so festive and has put me right in the mood for Christmas. What do you love to do with your family, have you ever visited the Baxters Highland Village? I'd love to hear where you go for your own little adventures, be sure to leave your comments below, or come share them with me on Twitter. As always you can follow more of my foodie faves and adventures on Bloglovin. Until next time folks, om nom noming my way up North. Their Christmas shop genuinely looked like Santa's workshop it was beautiful and so glittery. Though I must say I was in my element in their food store!